I didn't think my Bible bookmark was anything special, it just suited my needs. Apparently quite a few of you think it's pretty good and wanted the pattern so I whipped it up this morning. Since I was designing on the fly, how it ought to be constructed, wasn't how I actually did it. So to save a lot of fuss and bother begin with a row of split rings. For an explanation of the symbols, click on Legend in the sidebar. You can make the bookmark whatever length you want, you just need to start with an even number of split rings. The model has 20 and measures about 6.25 inches. Make sure you leave the mock picots between them wide enough for the large rings of the cloverleaves to join into on either side. If you are working with a variegated thread and a solid thread and you want the left side and the right side of the split rings to match, wind the thread onto the first shuttle and then unwind enough thread from the ball so that you can match up the colours coming from both the ball and the shuttle then fold the thread in the middle of a colour and put a loose temporary knot in the middle of the middle colour. That sounds like double talk but it'll make sense when you do it. Pull enough thread off the ball to use on the second shuttle and wind up both shuttles so that your knot is between them. Undo the knot and start tatting where the knot was. Now when you tat you'll end up with the same colours lining up on each shuttle. Once you have the row of split rings made you can start the outer row of cloverleaves and chains. If you are using a solid colour for the cloverleaves you can replace the second shuttle with solid colour thread at this point. It's easy to make a shuttle join into the side picot of the cloverleaf. Unfortunately if you are working continuously, this row will start with a chain and the first join is made to picot that doesn't exist yet. Hang a paperclip, safety pin or a loop of thread over the core thread at the joining point as a spacer so that you can pull out the core thread to make the join when the first ring is tatted. When you make the large centre ring of the cloverleaf, join between the first and second split rings. For each following cloverleaf, skip 2 split rings and join between the next all down the length of the split ring row. The last clover leaf will join in the mock picot before the last split ring. The end chain joins to the side of the clover leaf, to the starting split ring and then has another spacer for the join at the end and the first chain on the return row. Tat like the first row joining to the opposite side of the split rings. Finish the row joining into the last side ring and end where the asterisk is marked. The model uses 3 marker ends two in the solid colour and one in the variegated. 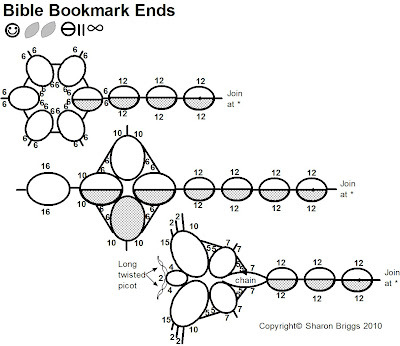 All of the ends are rows of split ring joined to the same point on the bookmark and marked with an asterisk on the pattern. The first solid colour end terminates in a 6 ring daisy. The first ring of the daisy is a split ring and the rest are normal rings. The second solid colour end is a cross which uses larger size rings that the split chain row. The first ring is a split ring, then one side ring is done with each shuttle and the last ring is done with shuttle 1. The middle end is tatted with the variegated thread and terminates in a butterfly. Since the variegated thread from the first shuttle was used for the chain around the bookmark the colours will not likely continue to be synchronized on the second shuttle, so it was just as easy to cut it off and start again. Match up the colours again before starting this end. At the bottom of the row of split rings tat a short chain. Join the small ring of the butterfly to the chain. Tat the large ring with graduated picots. Tat the small head ring with large twisted picots. (TIP - Make a long picot and the first half stitch, insert a straight pin and twist the picot. Make the second half of the stitch and pull the pin out. To make the matching antenna repeat the process and after twisting insert the pin back in the first antenna. Pull both antennae to the same length and then tighten the second half of the stitch.) Make the second side of the butterfly ending with a chain. Then tie a knot and sew in the ends. I made mine in a solid and a variegated size 80 thread with 3 ends, but you could make it all in one colour or 2 different solids or all variegated. You could use one end or many ends. You can make the ends all the same length, or you could vary the length. Mine were all different. I was wondering if the numbers would be clear enough and after Gina's comment I split the diagram into 2 sections and uploaded a larger version of each which should make the numbers more readable. 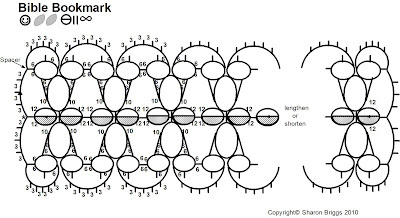 The split rings are 12/12 the clovers are R6-6-6-6, R6+10-10-6, R6+6-6-6 the stitch count between picots on the chains is 3. The stitch count on the ends should be clear enough to read. I'm dying to learn how to tatt! Thanks for sharing! That seems so complicated, but you explain it well. Thanks for taking the effort to share your work with us! For those who want to be able to read the numbers, copy & paste the photo of the diagram on a blank document, then pull the bottom corner diagonally as far as the margin. It will be grainy but easier to read the numbers. Thanks, Sharon, That's a very pretty bookmark.